I am coming to the end of a week of peregrinations around Cornwall. In Poetry Therapy, Nick Mazza talks about there being a receptive element (reading, listening, watching) and an expressive side (writing, talking, showing). A week ago, I was teaching at Trebah Gardens with the emphasis very much on the expressive (although obviously receptive to all that was going on in the room). This weekend, I’m in receptive mode – a punter at the Charles Causley Festival, taking part in a workshop, soaking up the atmosphere, listening to readings and talks and feeling held by the exquisite beauty of this corner of Cornwall. Typically for a border area, it’s less populated, less busy and less known than the famous areas of Cornwall further West, or Devon to the East. The above portrait of Charles Causley is by Peter Edwards , one of a series of paintings of poets he exhibited at the National Portrait Galley and which was then toured nationwide. After being in the Lawrence House Museum in too small a space, the Causley portrait is now in the refurbished Town Hall and looks magnificent. 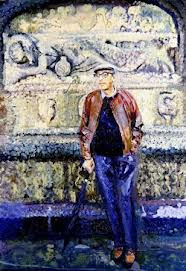 Today, Peter was in conversation at the Festival with Penelope Shuttle who, with her husband Peter Redgrove, was also painted by Peter. It was a fascinating session bringing together poems with painting. The exhibition included a poem by each poet and Penelope read The Weather House, the one she’d selected, which describes ‘the trembling galvanic rooms’ of her marriage. Yesterday, Andrew Motion spoke movingly about his family, relationship to poetry and his experience of being the Laureate. It was a warm afternoon, there was clear affection in the room. For him, from the audience, and from him for individuals present and for Charles Causley. In spite of the grand space of the Guildhall, there was a sense of intimacy. 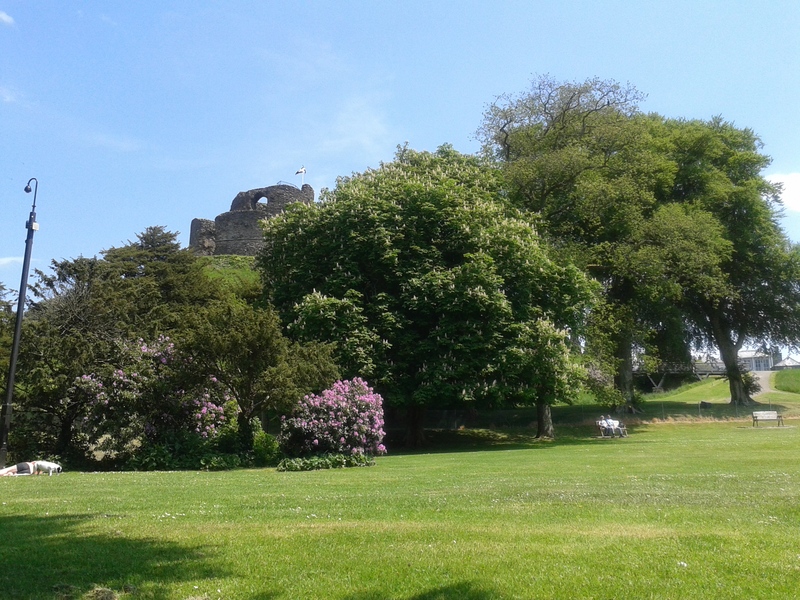 On Friday night, there was an open mic and informal readings in a gazebo pitched in the Launceston Priory ruins behind St Thomas Church, the focus of many Causley poems. Jane Nancarrow, a church warden, a local teacher and a former pupil of Causley read some of his poems. Here’s one she read – The Green Man in the Garden. For me, Causley’s poems have the depth, and sometimes menace, of fairy tales, accessing vital truths about the psyche. The Green Man has its own mythology, but on a personal level, it’s a creature of dreams, something within us asking to be heard, a wanderlust, a buried desire. Everyone who hears the poem ‘gets it’ whether they are a child or an adult, poetry reader or not. Like water often does, it has a surface simplicity, and lake-like depths – to paraphrase an analogy used by Andrew Motion about his sense of what poems should be – and what Causley’s definitely are. I’m chuckling now at that quote of Causley’s a little further down from The Green Man; “If I didn’t write poetry, I think I’d explode”. Yes, great line – there’s an archive recording of Causley on Desert Island Discs in 1979 with more interesting observations. Andrew Motion voices poetry like no other, for me. Whatever I hear him read or say becomes poetic. Do you remember that very original and generous radio series he presented in 2005, A Map of British Poetry, which I believe launched him as a media friendly Laureate? I think generosity is a key aspect of Andrew Motion’s approach to poetry – his own, his work as the Laureate and his openness and vulnerability in public. I’m an admirer!